Over the past month or so, my day job has been triggering my anxiety. The feeling of overwhelm, the fatigue, and the unhealthy coping mechanisms all started taking over and getting in the way of all the things I've been wanting to do. Anxiety comes with a lot of negative feelings, shame and guilt being two of the most destructive. And they never stay in one place. They leak into every area of life. Suddenly, I have doubts about things I'd felt full confidence in. I'm an avoider. Anxiety sends me right into my avoidance mode, which makes it all the more difficult to focus on getting things done. At least, things that are more productive than eating a pint of ice cream from the container while binge watching Marvel movies. It's important to understand that if you feel this way, it's perfectly normal. It's not very helpful, but it's just our fight or flight response to stress. The first step out of it, for me, is recognizing it and starting to take away the shame over my avoidance so I can get on with overcoming it. 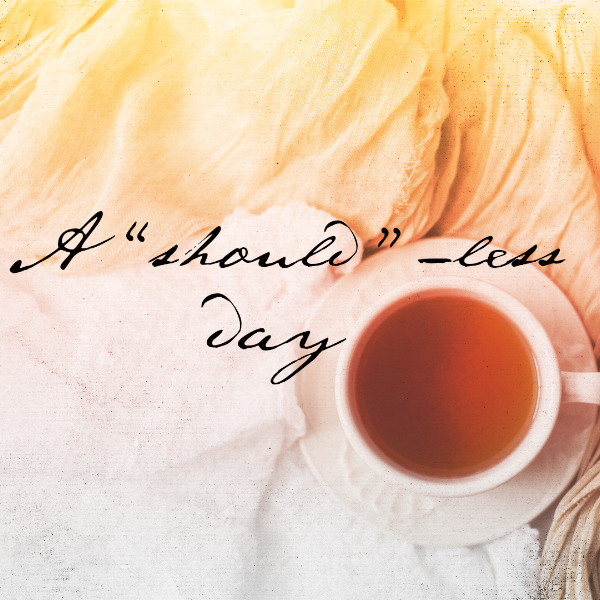 One of the best things I've done this week to try to move forward is to take a "should"-less day. One whole day when I didn't allow myself to dwell over things I thought I should be doing. Now, I'd love to feel this free of "should" all the time, but that's just not realistic. Taking one "should"-less day was something I knew I could do. I started off feeling excited for the day. I was looking forward to enjoying whatever it was I decided to do without the guilt and shame over all the other things on my to-do list. As the day went on, I would occasionally think of something I "should" be doing. I recognized it and reminded myself that I would either get to it, or not, and that today was not the time to worry about it. This wasn't a day of neglecting the things I really did need to do. There was still laundry, light cleaning, and following my morning and evening routines. But instead of thinking about how I should be working on business stuff while I was doing laundry, or thinking about how I should be vacuuming while I was writing, I focused on what I was doing and felt a sense of calm and purpose. This isn't just for people with anxiety. I think that as creatives, we all have so many ideas and projects that we can get bogged down by thoughts of all the things we feel we're neglecting or missing out on. All the things we should be doing. And that can interfere with our ability to focus on and complete a project, it can make us feel guilt and shame over how we spend our time. If you feel this way, try giving yourself a "should"-less day. If that feels good, do it regularly. If you can't manage a full day, start even smaller with an hour at a time. It's a mindset that can get easier with practice.